The fur is flying in the Mid East, catalyzed by the sanctions imposed on Iran. Hizbollah has moved 20,000 troops along its border with Israel, and Iran is using them as a proxy threat. 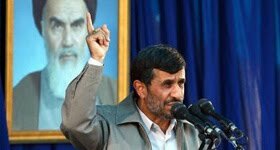 Mahmoud Ahmadinejad will be visiting Lebanon soon, showing that the alliance between the two countries, and with Syria, is strong and can pose a grave threat to Israel unless the West backs off on sanctions. Iran began freaking out when it found out that BP had stopped refueling their planes at European airports. There is also hysteria along the nuclear front. Although Russia's President had blunt words to say, that Iran should be more cooperative, etc,etc, blah, blah, blah, Russia also is bringing a nuclear reactor it built for Iran online. But who's really is making out over the sneaky behavior and chest thumping is France. They have just made deals with Saudi Arabia and Jordan to build reactors, with Egypt waiting in the wings. In the culture wars, Iran is planning on sending 1000 religious teachers into the schools, to root out opposition thought. The idea is to turn out young people who will not be so rebellious, and, with history being the best teacher, we know how this scheme will backfire... It appears that the perfect Iranian society, as envisioned by its social engineers, resembles American Catholic high schools of the 1970's. Next, they'll be making the boys wear brown corduroy pants and girls those strangely plaid skirts. Anyone who ever went to a party given by a Catholic schooler back then may remember how drunken and violently self-destructive they were... Iran also banned music again, and, hoping to turn the tide on the Internet, hopes to hire thousands of young folks to write pro-Iranian blogs, in an effort to drown out all criticism. Something tells me that the next wave of global hacking won't be directed at the Pentagon, but at Tehran. And here's a story where we may never get a straight answer, especially since the Iranian government is trying so hard to embarrass the US. Hint - kick back and relax, Shia dudes, we will eventually do it to ourselves. All you are doing is writing more stilted propaganda speech that nobody in the world talks like, and making everyone laugh at you. As my daddy used to tell me so often, if you keep your mouth shut people may think that you are a fool, but if you open it you remove all doubt... So, there was this Iranian nuclear scientist, or not, who went to a conference in Saudi Arabia and disappeared. The Iranian government claimed that the CIA kidnapped him and was holding him hostage in the US. He did end up in the US. The State Department said that he wanted to come here of his own free will and that he was studying at a college. The Iranian government created a fake video with an actor claiming to be the scientist that was shown on Iranian television, where the desperate scientist had claimed: "... he had managed to escape from US intelligence agents in the state of Virginia. "I could be rearrested at any time by US agents ... I am not free and I am not allowed to contact my family. If something happens and I do not return home alive, the US government will be responsible," he said." Oh no! Those evil CIA guys had him drugged and somehow he bravely managed to escape without betraying Iran and sent off his secret video! Come help me, daddy Mahmoud! Then, another video, made by US sources, turned up with some other well-fed guy who said he was the scientist said that he was living freely and had not been abducted, that aliens had beamed him aboard their spaceship and he somehow mysteriously re-materialized in a corn field in Kansas... Take that! To make matters even weirder, yesterday morning the scientist was "dropped off" in front of the special sections unit of the Pakistani embassy: "Iranian state media reported that Amiri asked for a "quick return" to Iran, and Basit said Iranian authorities were making arrangements to get him out of the United States. The US state department said on Tuesday that Amiri was "free to go," and that there was no evidence he was mistreated during his time in the US." The NY Times commented: "If the Iranian version is true, it is not clear how the man was able to reach the Pakistani Embassy section. If the second version is accurate, it is not clear why he would want to take refuge there." So, maybe in a week or two, Iran will spontaneously do something nice and release the two American hikers who had mistakenly wandered over the border into Iran from beautiful Kurdistan, thus avoiding a confrontation later this Summer between our two countries. Maybe Iran will agree to sit down for more nuclear discussions before the elections come November, and if the Israelis and Palestinians are also negotiating, it could be a rosy world for some Democratic candidates... Since the US is in the mood for spy swapping, expect to hear more about Jonathan Pollard, who was arrested in 1986, convicted for spying for Israel, and sentenced to life in prison. But who can we swap him for? Instead, expect to see a media campaign by the old, conservative american Jewish lobby criticizing Obama for his handling of Israeli and Middle East affairs. Now that the financial reform bill will pass, Obama's poll ratings have slipped even further. Of course, they aren't calling you and me to ask our opinions, so I suspect there is a small sample number in these polls. Calling a hundred people means nothing, and I doubt that they would ever call up a hundred thousand people... Anyway, Andrew Ross Sorkin called up the past Secretary of the Treasury, Henry Paulson, to ask him a good question: "If the Dodd-Frank Wall Street Reform and Consumer Protection Act had been in place during his tenure, would the financial crisis — and the ensuing recession — have happened?" His answers are interesting, that if these things had been instituted before 2005, then they might have had a chance to see what was coming and not felt blind-sided by events. Also, that the powere to take over a company in crisis like Lehman Brothers or AIG could have averted the crisis: "He said that he believed that if the government had had the authority to take over Lehman and A.I.G., it would have stopped the panic endangering other firms. “It’s hard to believe that winding down Lehman in an orderly way would have put more pressure on Morgan Stanley than what happened,” he said. But Mr. Paulson said that even more than the resolution authority, he saw the legislation’s creation of a systemic risk council as perhaps the most important aspect of the bill and crucial to preventing the next crisis. The council would give the various parts of government insight into what was going on elsewhere and the power to shut firms down or change practices that might put the system at risk. “Some things would hopefully have been identified earlier,” he said. While his critics have contended that regulators missed warning signs about impending problems, he said he had little visibility into certain businesses, like A.I.G., until it was too late." And newly elected tea party favorite Scott Brown has given his vote in favor of the finance reform, unless Rush Limbaugh castigates and strong-arms him enough in public to force him to change his mind. 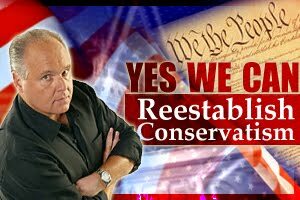 And you can't get much harsher than this BS: "Never in our lifetimes has there been a better chance to contrast conservatism with this? This is not just liberalism. This is full-fledged socialism, Marxism, whatever you want to call it. It's leftism, and there's never been a greater chance to draw a contrast. But we can't let these so-called moderates take control of the message or the agenda or it will be over, and by that I mean people like Scott Brown in Massachusetts..."